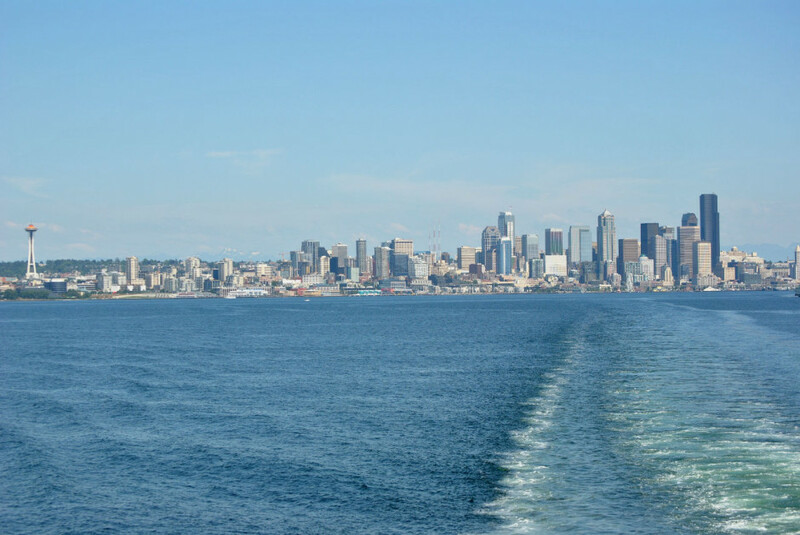 There is no singular landmass you can behold from Seattle as exaggerated or as striking at Mt. Rainier. 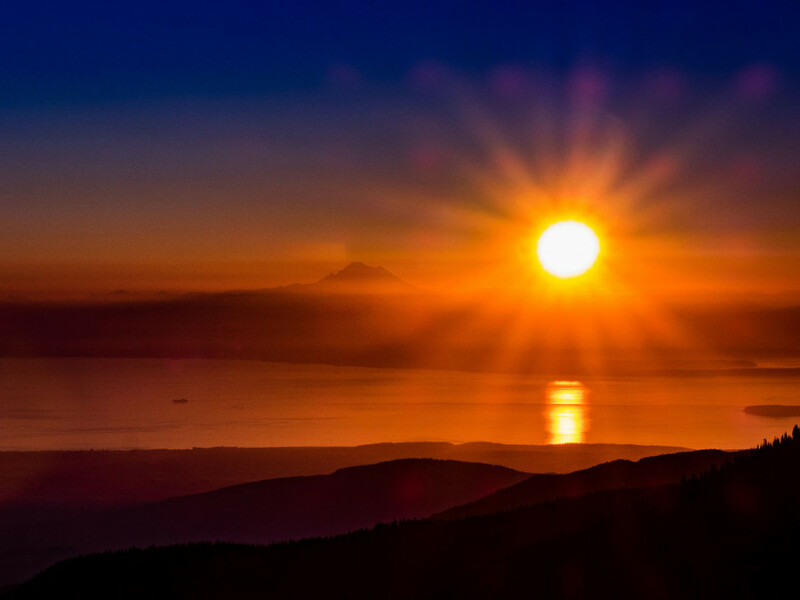 As the centerpiece of the fifth national park designated in the United States, the mountain has held the imagination of the country as firmly as it held that of the indigenous people of Washington, who called it Tahoma or Tacoma. 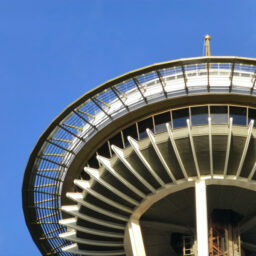 Kerry Park in Seattle affords the iconic view above; the deck of the Bainbridge ferry is another great vantage point. I don’t know what passes for a public library where you come from (if you’re lucky enough to have one in your community), but Seattle’s downtown public library at 1000 4th Ave. will rewrite the rules for you on what a modern public space dedicated to free knowledge and information can be. The unusual angles of the hive-like structure are shot through with light, and the scale of the place is simply massive. The Central Library has 400 public computers and a capacity for 1.45 million books. Its Yelp page reads like a series of soppy love notes. And free wifi. 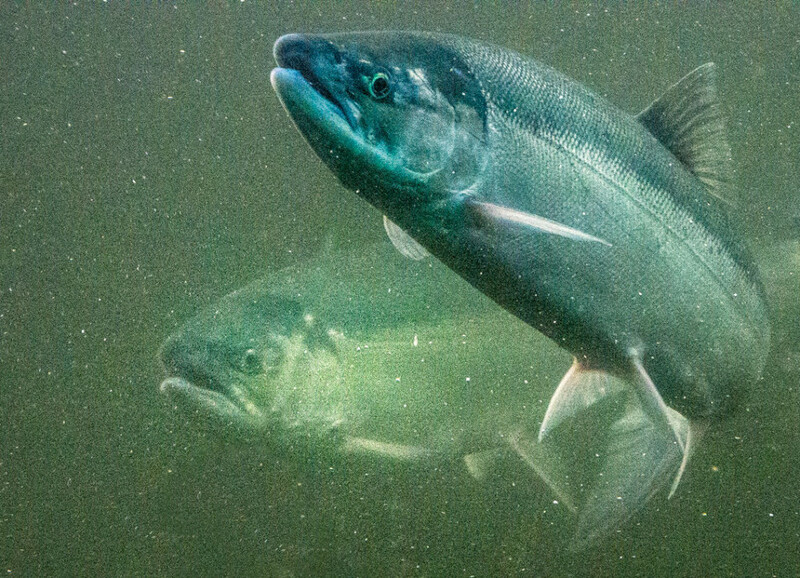 From mid-June through October, a visitor to the Chittenden Locks (in Seattle’s neighborhood of Ballard, the Chittenden Locks are a part of the larger complex generally referred to as the Ballard Locks) can get an up-close look at thousands of spawning sockeye salmon, one of the Pacific Northwest’s most iconic animal species. 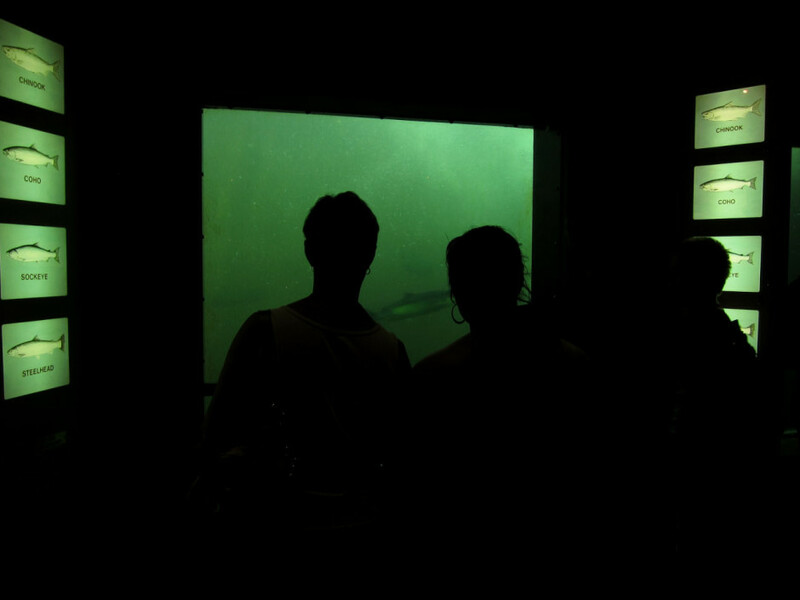 Glass panels below the waterline allow views of the ocean-fattened salmon jostling each other for space as they make their annual journey back to fresh water to lay their eggs. 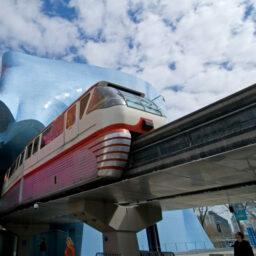 Architectural wizard Frank O. Gehry employed over 21,000 stainless-steel shingles in his mind-bending masterpiece of aesthetics and construction that is the Museum of Pop Culture (MoPOP). It’s a sight to behold from afar, from the air, from the smudged glass of a monorail window. But perhaps the best way to experience the MoPOP is to stand next to its shiny surface and stare at your warped reflection in the iridescent glow of the gold, silver, purple, blue, and chrome shingles. When does a building become a magic mirror? When you’re gazing at MoPOP. I love flying in and out of Seattle; SeaTac is one of the nicer places to touchdown in the US, in this traveler’s humble opinion. 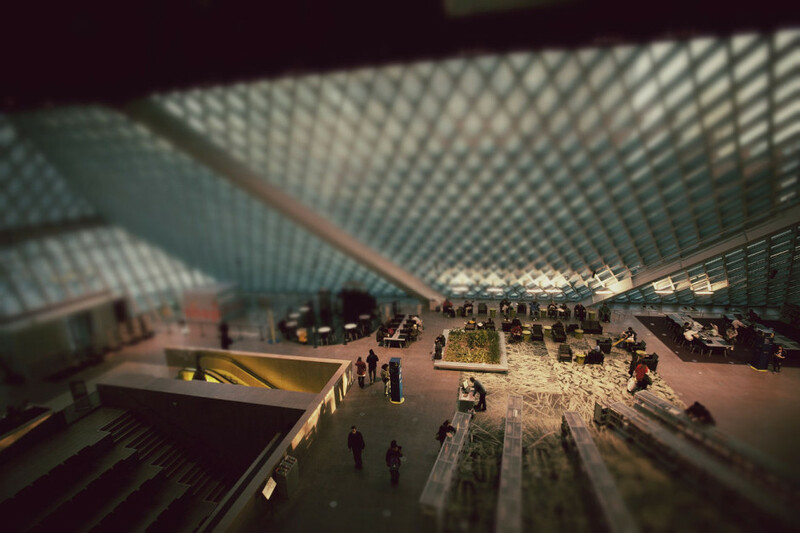 There are some great shops, art, and restaurants, but it’s the Atrium that I enjoy most. 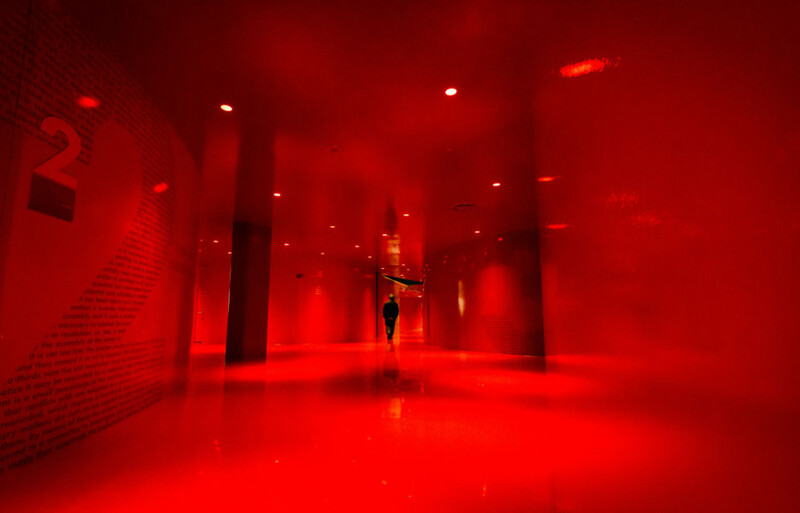 The terminal opens into a large chamber, ceiling hovering somewhere out of sight. 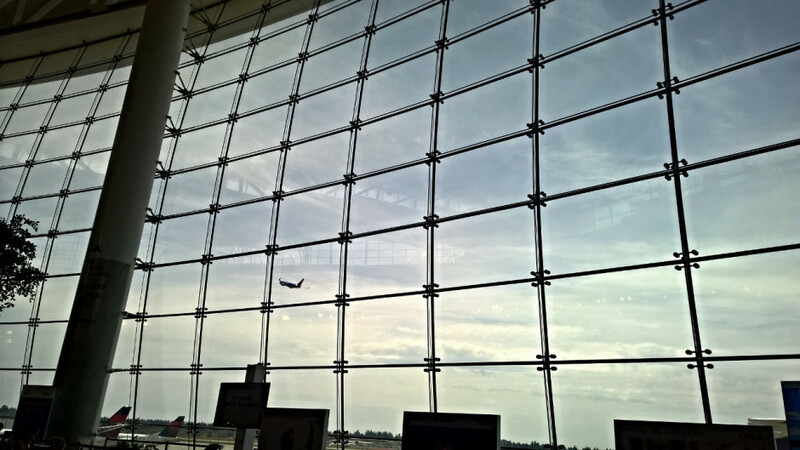 One entire wall is a network of metal and glass that faces a fleet of Alaska Airline planes taking off and landing. And in front of that enormous window-wall are a few dozen wooden rocking chairs. With time to kill before a flight, there’s no place I’d rather be. 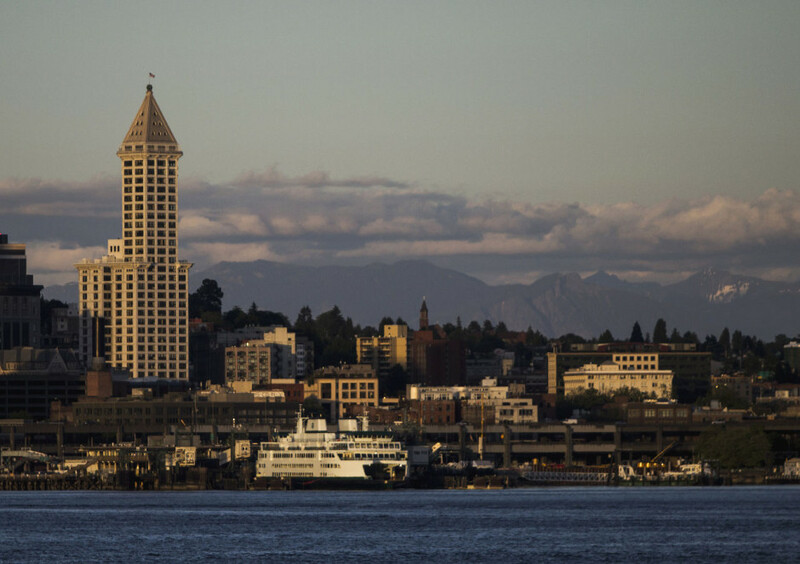 From the east, the Space Needle pierces Elliott Bay and the Olympic Mountains. From the north it points to Rainier. 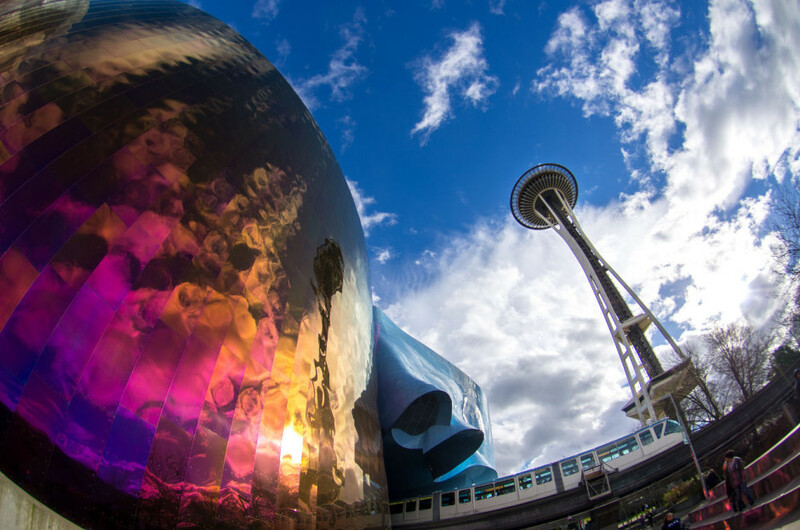 From the top of the landmark, on the slowly rotating observation deck, the cityscape blends with the Pacific Northwest; mountains and water stretch out forever. 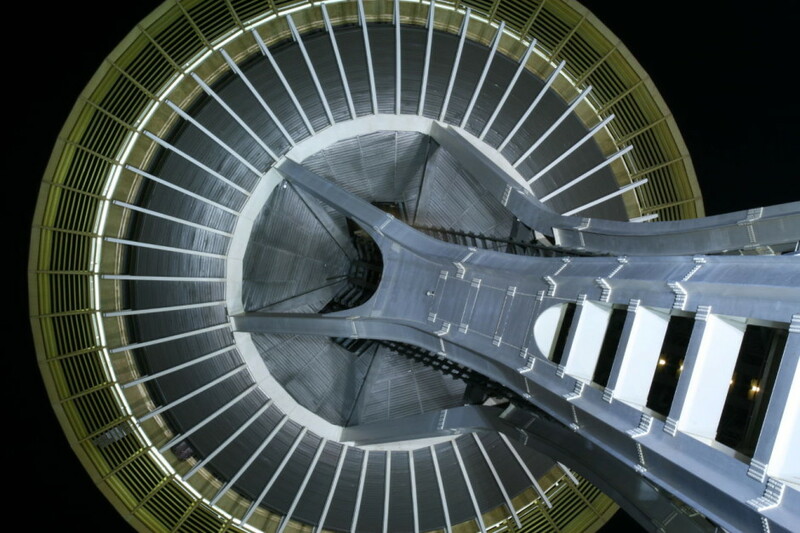 But the view of the Space Needle I love most is from directly below, preferably after dark. 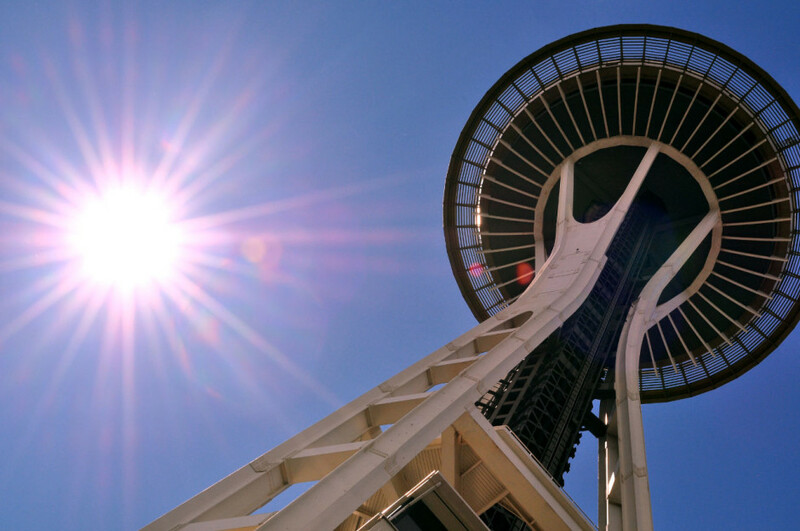 The needle is well lit, glowing with an even white light, and the circular top is held aloft by a stem that bows in then fans out as it connects to the observation deck. From below the deck looks like the gills of a portabello mushroom. The view is dizzying…and free. 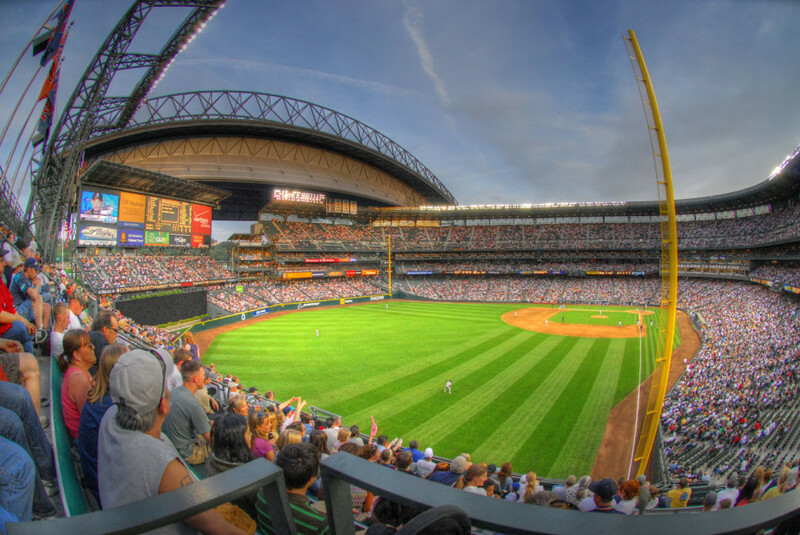 You don’t have to be a fan of baseball or a student of architecture to appreciate the superstructure that is the retractable roof of Safeco Field. 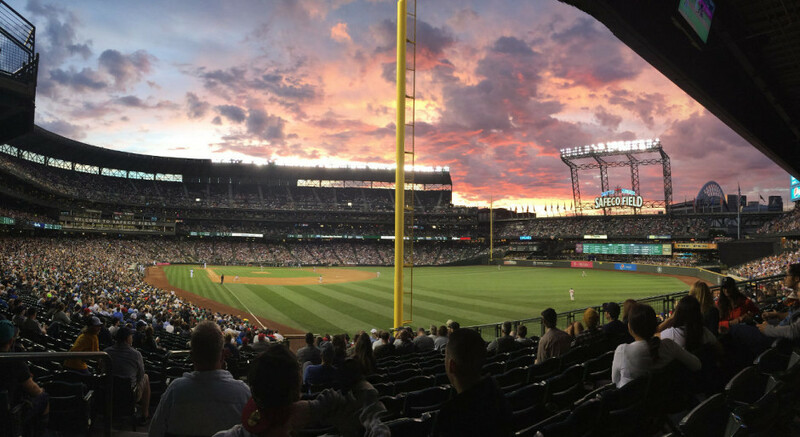 In a city where the sun may shine through a bluebird sky one day and the clouds may open up the next, you want a stadium that can adapt to the weather’s whims. When the roof is open, it gives the stadium the feeling of a modern Colosseum. From the nosebleed seats, the sky and the city skyline merge through a giant window of trusses, girders, and machinery. If you’re a daydreamer like I am, you may get lost in this window and forget the game going on below. When I think of sunsets, I think of the orange and pink flames that spring from the snowcapped peaks of the Olympic Mountains. I think of the day’s last light breaking atop the mountain chain like a wave upon the rocks. In my mind’s eye, I’m standing on Capitol Hill or down on the waterfront, and the Puget Sound is reflecting back the sunset, creating a field of undulating dazzle. 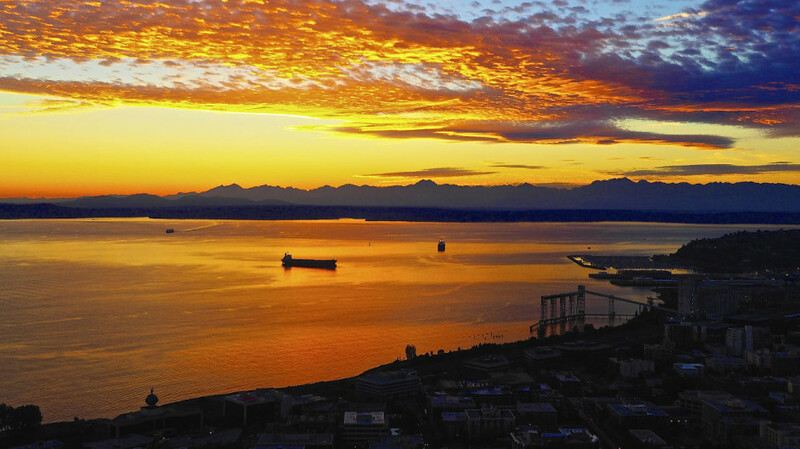 In the light of sunset, a perfect marriage of sky, water, and mountains is made for everyone in Seattle to see. 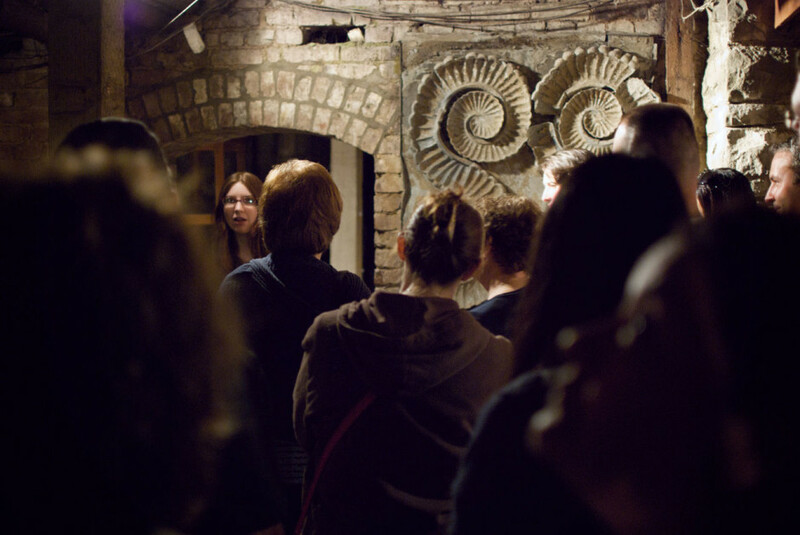 The subterranean corridors and forgotten storefronts that make up the popular Seattle Underground are so perfectly convincing it’s almost difficult to accept you’re not on a movie set. This was Seattle long before Safeco and the Space Needle. History sits quietly gathering dust under the strata of progress. 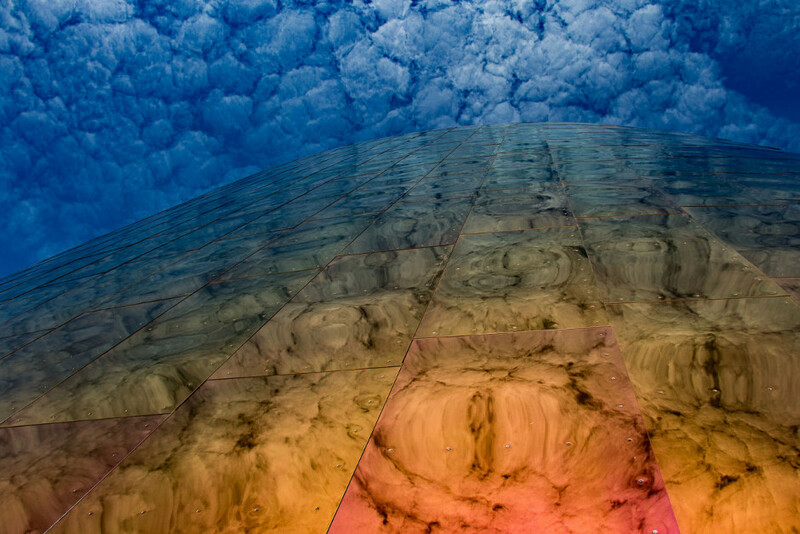 It’s all very fascinating, but the view from below that holds my imagination is the one through the murky and chipped purple glass squares that serve as skylights to the world above. Above ground, strolling around Pioneer Square, the old glass could be mistaken for nothing more than ornament. 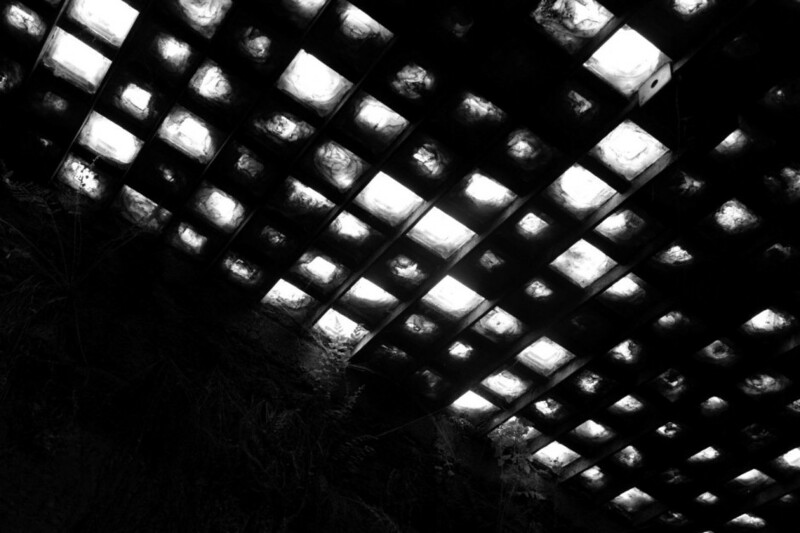 But from below it takes on the quality of a magic mirror, and if you allow yourself, you can feel like a spectator split in time… When you once more reach the surface, you’ll never look at the shiny sidewalk mosaics underfoot the same way again. 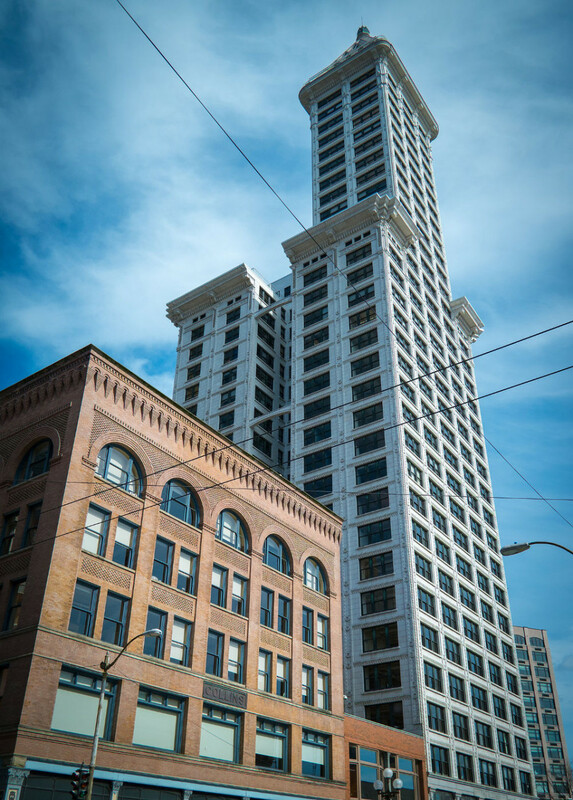 Now it’s the cute little dwarf of downtown, but 100 years ago Smith Tower elicited awe and admiration. It was for 15 years the tallest building west of the Mississippi and one of the first “skyscrapers” on this end of the world. It stands, conspicuous stone amid the modern towers, a staggering (in 1914 terms) 38 stories tall. For me, it’s the anchor that holds the historic neighborhood of Pioneer Square in place. It’s the axis on which ye olde Seattle rotates. To get my favorite view, find a chair on the patio of the Grand Central Bakery in Occidental Square, or head over to the historic pergola in Pioneer Square Park. Once upon a time, a forest of ancient trees grew from Northern California to Washington and beyond. Early explorers marveled at the tremendous size of the cedar and spruce and hemlock and at the extent of the forests. We began to cut them down around 1848, at the start of the California Gold Rush. Many areas were logged completely down to the nubbins. You’ve seen what remains of the giants in the national parks we’ve created to protect the survivors. 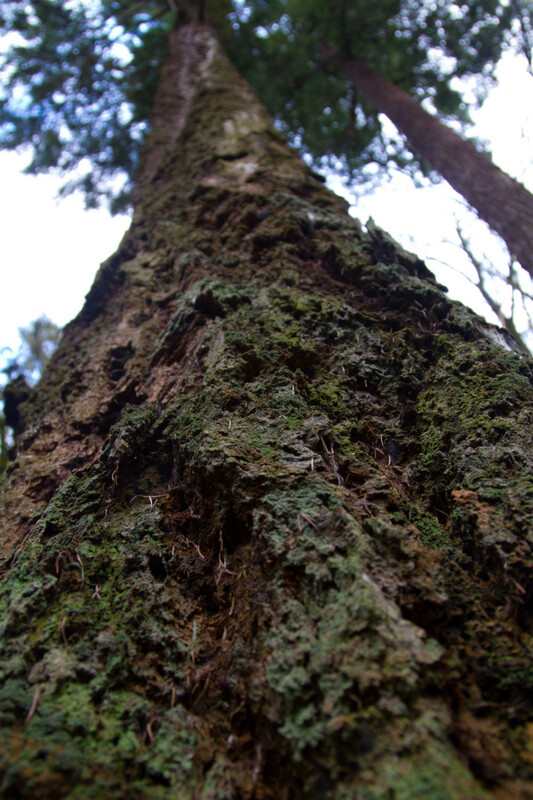 Yet, with a few minutes’ drive from downtown Seattle, you can stand next to a 250-year-old tree in a swathe of forest that feels like an alternate reality. 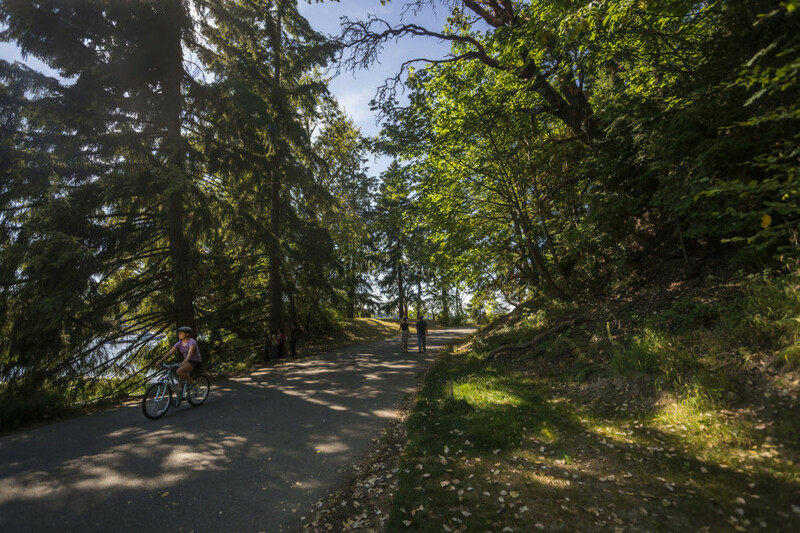 Seward Park contains 120 acres of old-growth forest and three miles of shoreline designed by the legendary park builders John Charles and Frederick Law Olmsted. Seward is one of those special places a nature-loving city dweller draws upon. Here, you can stand in a place that represents what Seattle was before it was remade by modernity. The ferry begins to rumble. Then it moves. 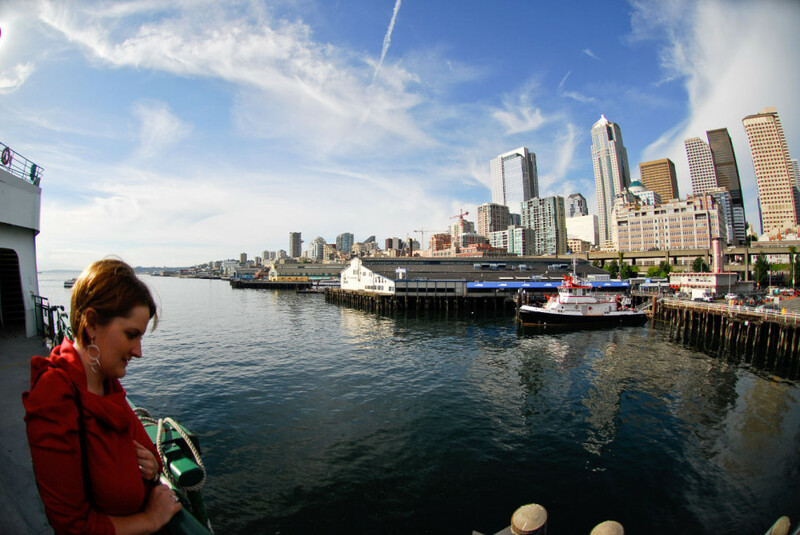 Maybe you’re standing on the deck of the Kitsap or the Tillikum or the Issaquah. Maybe you’re standing on the aft end of the vessel, facing the docks and the city when the water below begins to roil and churn as it’s agitated by the boat’s engines. Slowly, then with greater speed, the mighty vessel moves into the bay. The city widens and spreads itself out like an unfurling bolt of cloth. Now you can see all of downtown, now the Space Needle. Now you can see the full curve of Elliott Bay, and the green context the city is set within like a jewel. Now the city seems small and the distant mountains reveal their scale and majesty. Now you turn a corner and Seattle is a smudge against the sky. Love all the photos! 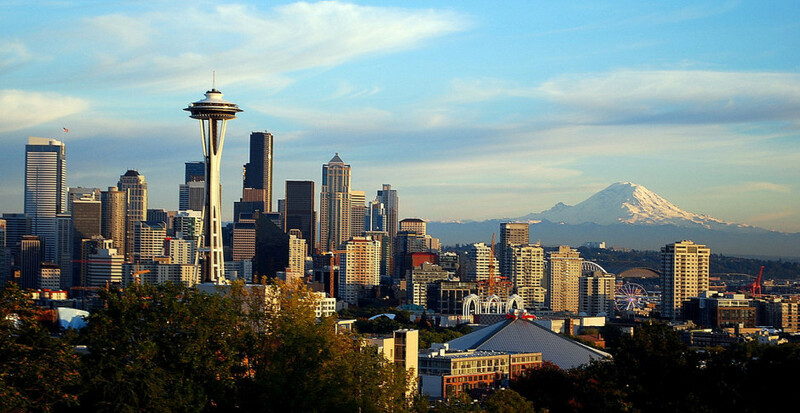 Love Seattle!!!!!!!!!!!!! Thanks ! Sun setting on the Olympics is the best!